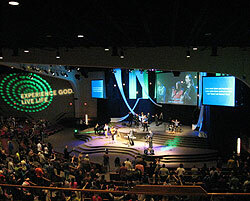 First Assembly of God – Fargo, ND | Tricorne Audio, Inc.
Situation: First Assembly of God in Fargo is a 2300 seat church with a variety of worship styles. The space also hosts several special events and concerts each year. Despite having carpeted floors and padded pews the sanctuary suffered from acoustical issues due to its parallel concrete walls and large interior volume. In addition to remedying the acoustical issues, the church wanted to update the speaker system to create a more intimate setting for its parishioners and improve the overall sound quality. Solution: Tricorne Audio, Inc. began by performing an AcoustiTools study, and taking comprehensive listening tests within the space. The most notable acoustic issue was the flutter echos between parallel walls. These echoes varied depending on location but were a major distraction to a large portion of the seating area. To resolve these echoes two bands of 4′ high MBI Colorsonix wall panels were placed strategically on the two rear walls of the church. These panels essentially eliminated the flutter echo and significantly improved the feel of the room. In Phase II, the existing speaker system was replaced. EAW QX series speakers were demonstrated in a side-by-side comparison against the existing system. This demonstration quickly revealed that the old system was dated and that the QX system was exactly what the church was looking for. Along with new speakers, the system also received new QSC amplifiers, additional subwoofers and a pair of EAW UX3600 processors. The combined results of the improved acoustics and speaker system upgrades speak for themselves with a very satisfied customer.